Less chemical is required with anti-icing to prevent ice bonding than trying to remove ice after it has bonded to the pavement. The rule-of-thumb is that removing ice or snowpack after it forms (de-icing) takes ten times more energy than preventing the formation (anti-icing). Liquid brines have proven very effective at preventing bridge deck and pavement frost. Liquid brines for anti-icing applications have been reported to last for several days. Application can be made during regular working hours, reducing some overtime costs. Liquid brines are already in solution; their melting action is nearly instantaneous. Liquid brines can be used to both pre-wet solid chemicals and anti-ice pavements. Liquid salt (NaCl) brine can be made in the field, on-demand and with a low cost. Can be applied at lower rates than solids and adhere better to the pavement. EnviroTech Services offers BetterBrine®, BOOST™, AMP® for those who are interested in Anti-icing with Salt (NaCl) brine with reduced corrosion and improved performance over that of 23.3% Salt Brine alone. The use of MgCl and CaCl brines as anti-icers is only recommended by EnviroTech Services to be applied “as the first flake fly's”. For ant-icing and deicing with Magnesium and Calcium Chloride Brines EnviroTech Services offer MeltDown APEX which is the premier Magnesium Chloride brine for reducing corrosion and maximizing performance. MeltDown APEX-C is our newest offering that adds the benefits of the APEX product to 32% Calcium Chloride Brine. CaCl with Boost™ is another offering we have for enhancing the performance and reducing corrosion of 32% Calcium Chloride Brine. 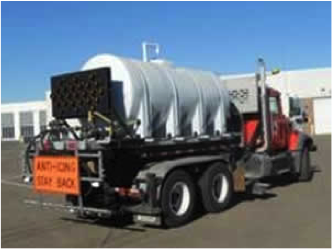 Costs for new equipment needed to apply the anti-icing liquid to roads that may be needed, including bulk storage tanks, on-board tanks, pumps, and spray applicators. Liquid brines will become diluted (and may refreeze) more quickly than solid salt during heavy snow or ice storms. Transporting chemicals that are mostly water (68%-77%) can be costly, but due to lower application rates coverage of lane miles is better. Liquid brines cannot be used for anti-icing when freezing rain, glare ice, or snow pack conditions exist. Application rates in the range of 25-50 gallons per lane mile are being used. This is equivalent to 60 to 120 pounds per lane mile of dry chemical. Even smaller applications of 15 gallons per lane mile have been shown to be effective in anti-icing for frost. The actual liquid chemical application will depend on the choice of chemical, air and pavement temperatures, and storm conditions. CDOT has completed a three-year study into the effects of magnesium chloride on the roadside environment and has found that MeltDown APEX does not significantly harm aquatic or plant life. In fact, the sand/salt mixture used in the past can be more damaging to aquatic life as large amounts of silt are washed into streams. The magnesium chloride brine, also known as MeltDown APEX, does not add air pollutants to the environment and improves air quality by offsetting usage of sanding material. Unlike sand/salt mixtures, the liquids will not damage your car's paint job or windshield. Some utilities report that mist from liquid brine road treatments, which become airborne due to contact with fast-moving vehicles, can coat insulators that separate electric conductors from the poles that support them. Utility companies perform maintenance to remove the coatings from their equipment to reduce the risk of outages. Liquid anti-icers have less negative impacts on highway bridge decks, trees and vegetation, and water supply than any other method of winter road treatment. Liquid anti-icers are the best products available for preserving the environment. 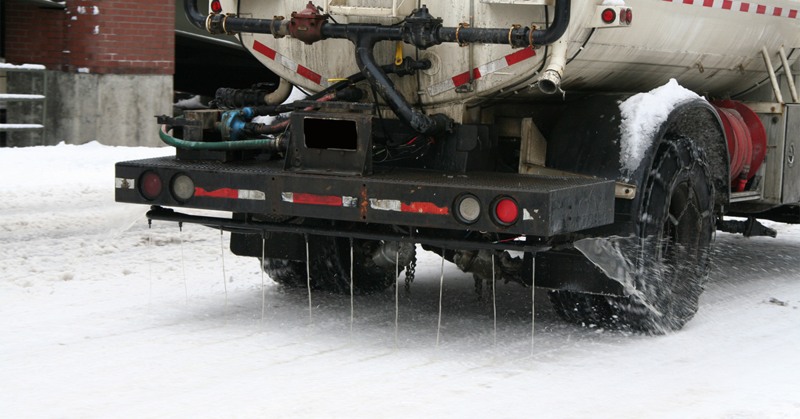 Liquid anti-icing technology can result in significant cost savings for the state, taxpayers, consumers and corporations. Lives have been saved by reduced accidents and reduced response time to medical emergencies. Everything that goes on the road ends up in the environment, so it is important to be careful what and how much you use whether it is liquid or traditional salt/sand. If you implement anti-icing properly, you will use fewer chemicals than with deicing alone, and less abrasive material. This makes anti-icing an environmentally sound choice. Although both liquid and granular anti-icing /deicing products have benefits that, when applied correctly, will maximize service levels to keep people safe while minimizing costs to you and the environment.